Of course, in order to re-photograph this recipe, I had to make it again and gosh, I’m so glad I did. I forgot just how flippin’ delicious this creamy and punchy curry is! This recipe came to fruition a few years ago when I went pescetarian. Initially, we thought that cooking for both pescetarian and omnivore (for my husband) diets would pose an interesting challenge. Fortunately, a lot of dishes we enjoy are flexible and welcome tofu or shrimp instead of chicken, beef, or pork. This Easy Thai Red Curry With Tofu is a perfect example of that. Now that I’ve phased poultry back into my diet things have definitely gotten easier—but when we make this curry, it’s always with crispy tofu. That’s how good it is; nothing beats the way that crispy tofu soaks up all of that yummy and tangy sauce. I know there are a lot of tofu skeptics out there, but if you cook it properly, it’s magical. Nobody wants to eat a watery sponge, which is essentially what tofu is when you initially unpack it. But taking the right steps to bring it to a golden crisp is life-changing. And I’m going to tell you how to do it. How to get crispy tofu. For years I was pressing my tofu an hour before starting meal prep. It seemed like a legit method — and with a quick toss in some starch and a trip through the air fryer, I always ended up with crispy tofu. But there’s a new method in town, and it’s chill AF. Freeze your tofu overnight, then boil it. (Whut?) Yes. Ready for a science lesson? And instead of leaving it out to thaw on its own, just carefully give it a swim in some boiling salted water. I know that boiling tofu sounds counterproductive when what we’re trying to do is remove the liquid from it. But boiling tofu in salted water pulls the moisture from it, leaving you with the same result from pressing in a fraction of the time. BOOM. 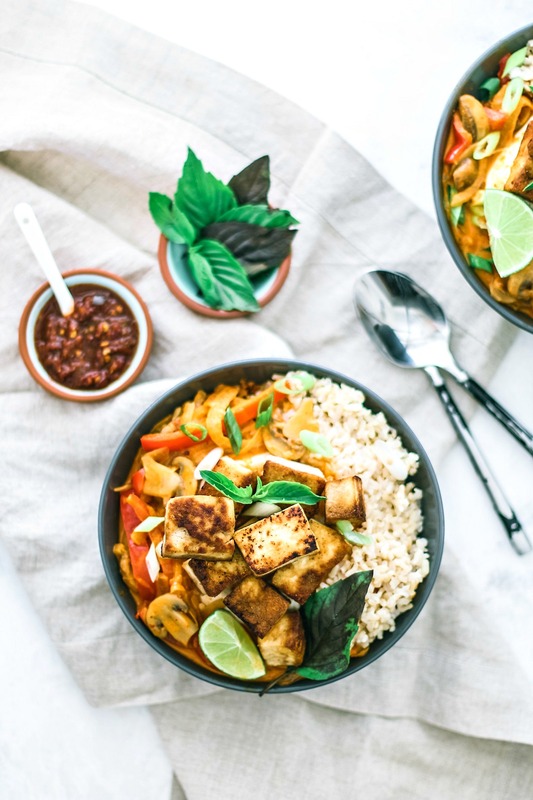 Easy Thai Red Curry With Tofu. Or not with tofu. If you’re reading this and thinking, “Damn, this would be great with this protein… then DO IT. This recipe is super flexible. You can also swap the veggies I’ve used for veggies you’d prefer. I’ve made his with broccoli before and it. was. dynamite. If you do come up with your own alterations, let me know about it in the comments. If curries are your jam, you need this Thai Coconut Fish Curry With Kabocha Squash and this Vegetarian Chickpea Curry With Coconut Milk in your life. OR. Bring your sandwich game up a few notches with this Healthy Curry Chicken Salad With Grapes! This Easy Thai Red Curry With Tofu is super flavorful and extremely flexible. Though this recipe uses crispy tofu, you can swap in any protein from shrimp to chicken. 1 TBSP sambal oelek chili sauce More or less, depending on how much heat you want. 1 lime, zest and juice Zest the lime before juicing it. Toss all of the marinade ingredients together in a large bowl. Place your tofu in a large freezer bag or sealable container and pour the marinade over top. Cover, give it a light shake, and place in the fridge to marinade for 30-40 minutes. Once the tofu has cooled, cut it into 1/2 x 1/2-inch cubes. Heat a skillet over moderate heat and add 1 TBSP of olive oil. Add the cubed tofu and sear for about five minutes on one side. Give the tofu a few splashed of tamari or soy sauce if you'd like, for extra flavor. (You can add other aromatics to the pan, but add them closer to the end of cooking time. Especially garlic, since garlic will burn and just become bitter.) After five minutes or once the tofu has developed a golden crisp, carefully flip over and crisp up the other side. All in all, this should take about 10 minutes. When your tofu is done, remove from heat, cover to keep warm, and set aside. Then start your curry. In a large saucepan or Dutch oven, bring 1/4 cup of water to a simmer over moderate heat. Add the minced onion, garlic, and fresh ginger. Stir to combine, and simmer for about 5 minutes or until the garlic is fragrant and the onions are translucent. Add the sliced red bell pepper and mushrooms. Stir in the 3 tablespoons of red curry paste and stir until the veggies are evenly coated. Add the coconut milk, fish sauce, lime juice, and lime zest. Stir until the curry paste has dissolved into the liquid and there are no clumps. Let the curry simmer for about 15 minutes on low. Don't let it simmer much longer than that, or the liquid will reduce. If you're serving rice with your curry, start to prepare that now as per the package's instructions. Once the rice is ready, serve in a bowl and spoon the curry over the rice. Top with crispy tofu and garnish with fresh Thai basil ribbons and sliced scallions. **This recipe used to call for the tofu being tossed in corn starch post-marinade and before frying. You can still do this. If you do, be sure to shake the excess starch off before frying the tofu so you don't end up with clumps. The reason I've omitted this step from the recipe is to simplify it since freezing + boiling the tofu in salt water has proven to bring the tofu to a nice crisp. Marinating it is optional. Who knew about that tofu boiling tip?! Can't wait to try it and make this delicious looking curry dish! I love the tofu marinade! So flavourful! Plus the the curry sounds so delicious and warming! Perfect to have on a chilly day! Gorgeous photos! This looks so delicious! Perfect for an easy weeknight dinner! This looks so flavorful and delicious! I can't wait to try it! Oooh I need to make this for my husband, the tofu skeptic!! LOVE the flavors in this and can't wait to introduce him to a delicious way to cook tofu!! Tofu is such a great ingredient to use, so easy to adapt. The delicious spices are perfect to flavour the tofu, and the overall dish sounds amazing. Also great photos! HI. Thanks for the recipe, but when do you add the lime and lime zest? It's in the ingredient list, but not in the directions. Thanks. Hi Linn! Sorry about that — and thanks for pointing it out. I'll have to fix it. Add and stir the lime juice + zest at the very end, right before serving! ....i think there is something wrong with this page. i was just following it for a marinade for the tofu which involved rice vinegar and then corn starch to fry the tofu before it is added to the curry. that has disappeared now. im really, really confused because i left this page up as i was taking a break between letting the tofu marinade and making the curry. did you just edit this? if not, there seems to be a very odd glitch in this page. Hi Ally! This *was* just edited this morning and is still being edited. I'm happy to guide you from here, though. Once your tofu has finished marinating, toss it in a bit of corn starch — just enough to coat. Shake off any excess. Heat a skillet with 1-2 TBSP olive oil and fry the tofu until golden crisp. This might take about 10 minutes to get each side. Once done, set aside and add to your curry when it's ready. I'm so sorry this was edited as you were using it — what are the odds? I've had a lot of people contact me about making the tofu bit simpler, which is why I've edited that part. I hope you enjoy it! And yes, you're right. There is rice vinegar in the marinade. The above comment had me confused with the mention of "glaze" and had me thinking they were using regular ol' vinegar and perhaps in the wrong recipe all together, since there is no glaze or vinegar to cook. The vinegar is in the marinade. Not the sauce. Hey Henry, I'm really glad you enjoyed this dish and I love your adaptation of using chicken drumsticks! What a great idea. It really puts a different spin on the dish overall. Thanks for your feedback! Made this tonight - it's delicious!! Very straightforward Thai curry recipe. Thank you for posting this. Sometimes I get carried away with Thai curry and try to add too many ingredients and it comes out a mess. Your recipe kept me on track and was super delicious. I used pan-fried tofu. I usually press it in a tofu press first, then pan fry on 3-4 sides. I used only 2 T of curry paste since mine is suuuuper spicy (Maesri red Thai curry paste) Added 2 T brown sugar to offset the spiciness - probably a little too much in retrospect I loved this recipe, thank you so much! Thanks a bunch, Revathi! Thai dishes always look so gorgeous, but this one definitely delivered on the aesthetics. I was pretty jazzed about it! This looks absolutely outstanding! We love curries here at my house, and this version is just gorgeous! Your tofu and chicken options are so wonderful and add a lot of flexibility, which I really appreciate, too. Definitely pinning! Look at how the colors of your curry POP!!!! Love it! Thanks for sharing this easy yet tasty Thai curry. I'm hungry now! Thanks, Levan! I'm so glad this recipe got you hungry - hope you can make and enjoy this soon! It really does taste as bright as it looks. Love Thai cuisine! Very intelligent folks. Love curries - red, green and in between - and the two options. Your photos are mouthwatering! Thanks so much, Jacquee! I feel like I need to play around with green curry a lot more. My husband and I are always craving for Thai food. We probably spend way too much in Thai restaurants! This looks just perfect. I can't wait to try it! It's taken a long time, but I'm finally falling in love with tofu, so this is right up my street! Loving all the flavours you have going on in this! Hey Annie! I know what you mean. It took me a while to realize how delicious tofu can be and how it's all in the prep and the flavors you put with it. I'll be posting another tofu recipe soon - a vegetarian spin on beef and broccoli. It was a total hit last night! Kind of addicted right now and battling with the idea that I can't ~always be posting tofu, haha. Looking at all of the wonderful color in the curry is making so hungry! Hi Rachel! I hear you. Every time I revisit this post I feel the need to make more. Your photos are beautiful! Thai red curry is our favorite and I can'r wait to make a big pot of it! This looks healthy and flavorful. Your pictures are awesome! Hey Clyde! Thanks so much for the compliment. It definitely is a flavorful dish, and absolutely on the healthy side. A winning combo in my books! Thank you! Red curry really is hard to beat - such a warm and spicy depth of flavor. Beautiful photos! I made my first ever curry last week and apparently I went too heavy with the curry and far too spicy for me. Is it always that hot? Have never cooked with it before. 3 tablespoons sounds like it might kill me! Thanks so much, Kathi! Curry should only be as hot as you'd like it. What kind of curry did you buy/use? 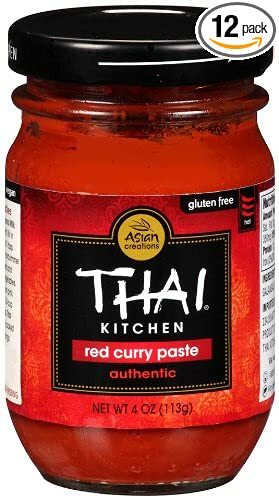 The curry I used is A Taste of Thai's red curry paste. But there are so many different variations of curry, so you may have been playing with a really spicy one. Here's a link to the one I swear by! (Hope the link works) Give that one a shot - you should be okay :) Let me know! Thanks, Valentina! Red curry is my absolute fave as well. It's just spiced perfectly. I do want to get more acquainted with green curry. I've only used it once, and it was with peanut butter in a green curry and peanut broccoli soup. It was delicious! But I feel like I need t explore it more. Wow look at those colours! I love Thai curries too and now I'm dreaming about dinner already (like 2 seconds after finishing my lunch)...! Haha, you sound like me - craving things after I've just eaten. Nice to know I'm not alone in that. This dish really is super colorful! And it's so easy to throw together. A total guest pleaser. I'm looking forward to making it for guests some day.